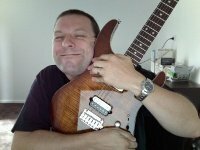 This fourth installment of the Discover a Guitarist series is a guest post from Jon Bloomer of Guitar Noize. 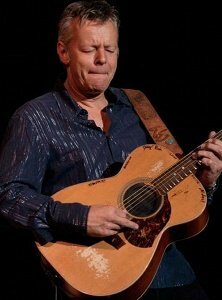 Tommy Emmanuel is one of Australia’s most highly respected guitar players with a career spanning five decades. He is most famous for his acoustic fingerstyle playing. Tommy had the honour of C.G.P. (Certified Guitar Player) bestowed upon him by the late Chet Atkins, one of Tommy’s main influences along with Jerry Reed. I am originally from England but in 2002 I came to Australia for a year-long working holiday, well that was the plan. Ten years on I have an Aussie wife, two kids and a house in the ‘burbs! Anyway back to my point, I was watching TV one day sitting in my Sydney apartment when I saw an advert for Tommy Emmanuel with a quote from Eric Clapton saying he was the greatest guitar player in the world or something similar. I hadn’t heard of Tommy at this point despite him being a household name in Australia, but I was interested to hear his music if Eric Clapton spoke so highly of him. At that point in time I hadn’t picked up a guitar for years. I completed my Bachelor of Music degree in 1998, and the intense regimented nature of studying classical guitar took its toll on me and made me quit playing altogether in ’96, at which point I switched to Music Technology and Composition as my major. In late 2003 I was sitting at work one day when I suddenly remembered the ad I had seen on TV so decided to check out Tommy Emmanuel on the web. Bear in mind this was two years before YouTube even existed, so I went to tommyemmanuel.com and listened to a preview of a track called “Train To Dusseldorf” from his 2000 album Only, and my jaw just dropped. How could I have not heard of this guy before? How can music like this exist without my knowledge? More importantly how on earth does he do that?! I was instantly hooked and within a couple of months had bought myself an acoustic guitar and the Only TAB book and album. So that was my introduction to Tommy Emmanuel, but as soon as YouTube launched, videos starting appearing weekly with some amazing performances. One of the most popular to date is his “Guitar Boogie”, which was posted up in 2006 and has had nearly 8,000,000 views to date. Check it out for yourself, but beware Tommy can play things on an acoustic that guitar players like me can only dream of doing on an electric guitar! For more videos, check out Tommy Emmanuel’s YouTube Channel. Well first of all like I said, if it wasn’t for Tommy Emmanuel I probably wouldn’t be playing guitar today, and my website GuitarNoize.com also wouldn’t exist. Secondly, trying to imitate Tommy on acoustic guitar is a tall order for most of us, and although I bought the TAB books and learned a few tunes acoustic guitar has and always will be secondary to electric guitar for me. Whenever I pick up my acoustic I usually attempt a couple of his tunes (or butcher them! ), because I feel I am getting more out of my instrument and challenging myself more than just strumming a few chords. I have been inspired by Tommy’s music, virtuosic skills and his commitment to the instrument. Not many people can say they have been touring all over the world for as many years as Tommy, and he rarely takes a break from tours. Tommy’s live shows are fun and enjoyable to watch even for someone who doesn’t play guitar, so try and get to a live show if he is on tour in your part of the world. Already a fan? Leave a comment below and tell us how you discovered Tommy’s playing and what it’s done to you. I’m looking for guest-bloggers to help me out with this series, so it’s not just about the guitarists I love. If you have a story to tell about discovering one of your own favorite guitarists, email me at my email, and we’ll discuss getting you a guest spot on the blog. Jon Bloomer is the founder of Guitar Noize. When Jon isn’t writing about or playing guitars he can be found frowning at a screen full of code wondering why he isn’t playing his guitars.